Trade paperback available online and at your favorite bookstore upon request (distributed by Ingram). E-book (Kindle, Nook, Apple, etc.) available at Amazon, Barnes & Noble, iTunes, and many other online booksellers. Low Gap Cafe in Low Gap. Copies are also available in Prairie Grove Library and Lincoln Library. Hear the music of a singing cowboy—who almost becomes Roy Rogers—as he finds love with a hat-wearing quirky lady. Their coming-of-age stories converge revealing lives honed by life-threatening hardships in the flatlands of Texas, the high plains of New Mexico, and the green hills of the Arkansas Ozarks. In an unlikely "Land of Opportunity," their sons rise, and Black & Kiddo turn weathered hands to new work, heartened by the long arc of dreams. "I treasure this book about a man who was almost famous and the feisty woman who was the love of his life. The story unfolds against a background of rural America as it undergoes decades of important change. The people you’ll meet here are extraordinary in their resilience and their passion for each other, their families, and for a life that included enough hard work to stop me in my tracks. 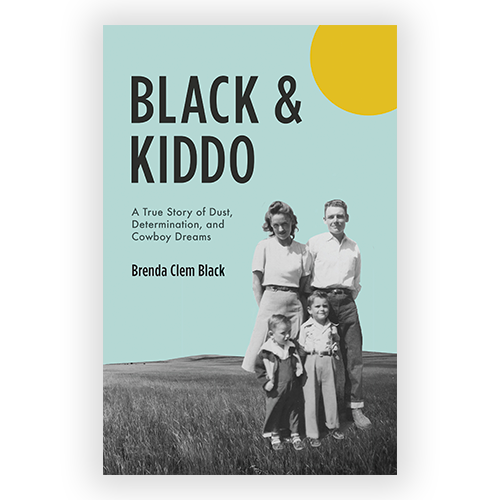 Brenda Black’s writing brings out the adventures, the humor, and, best of all, her own palpable affection for Black and Kiddo. Well done." "This true American saga captures the spirit of the West and makes a music of eternal hope. A heartening tale thick with humor, honesty, and insight that will deepen your sense of Home." —Marilyn H. Collins, CHS Publishing, Rogers: The Town the Frisco Built, Writing History Right"